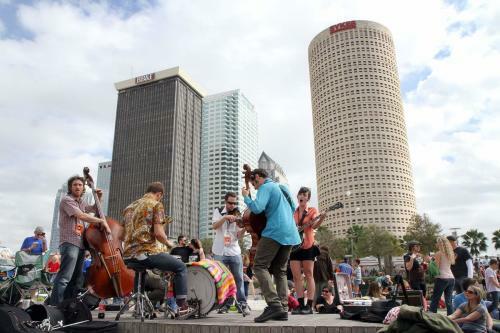 TAMPA (May 10, 2018) – Tampa Bay’s tourism industry set a new benchmark -- $4 million in a single month for the first time – thanks to record hotel revenues and occupancy in March. Since the budget year started Oct. 1, six of the last seven month have posted new records for Tourist Development Tax revenues. April’s bed-tax report, covering room nights in March, totaled $4.08 million, about 12.4 percent higher than the same period in 2017. Hotel revenues are approximately 20 percent of overall spending by visitors. The remainder includes dining, shopping, and activities, among other things. Last year visitors spending reached a record $6 billion. During March, Tampa Bay hosted Gasparilla Festival of the Arts, Gasparilla International Film Festival, Gasparilla Music Festival, the Florida Strawberry Festival, Florida State Thespian Society, The Association of Writers & Writing Programs, the Southeast Produce Council, and the Lumbermens Merchandising Corp., among others. March was also the key month for the Bay Area Renaissance Festival, Spring Training, Busch Gardens® Tampa Bay Food & Wine Festival, Tampa Bay Beer Fest, and plenty of other events. March’s TDT revenue figures reflect new monthly peaks for occupancy (87.4 percent), average daily rate ($148.16 – up 6.3 percent), and revenue per available room ($129.41, up 7.4 percent) – an important measure of hotel profitability. Since March 2018, Hillsborough County has added about 500 rooms, reaching 22,256, according to industry analyst STR Inc. Most of that grow was in the Brandon area. With several new hotels under construction across the county and more on the horizon, room inventory will grow by more than 1,000 rooms over the next few years. The new record for March comes after the recent declaration that, as of Dec. 31, 2017, visitors to Tampa and Hillsborough County generated more than $644 million in taxable hotel revenue and produced a record-setting $32.3 million in bed taxes, up more than 8 percent from the total for Calendar Year 2016. That boosted into the elite ranks for Florida’s handful of high-impact tourism counties. Visit Tampa Bay’s sales and marketing success has made Tampa and Hillsborough County an increasingly popular travel destination and helped push room rates up nearly 22 percent during 2017, versus 11.2 percent for Florida and 10.3 percent for the U.S. Yet even as rates rose, Tampa Bay remains one of Florida’s most affordable destinations.